OK, I admit: The first time I did a couple of "Critics Roundup" segments for At the Movies, I felt like I'd charted heretofore unplumbed depths of total suckage. Indeed, I feared that, after the taping, a producer would call me and say something like, "Uh, Joe, that really didn't, er, work out, did it? So, well, we're going to, like, edit you out..." But I guess I didn't stink up the joint as badly as I feared. They asked me back to tape a new segment today with hosts Ben Lyons and Ben Mankiewicz and Matt Singer of IFC. 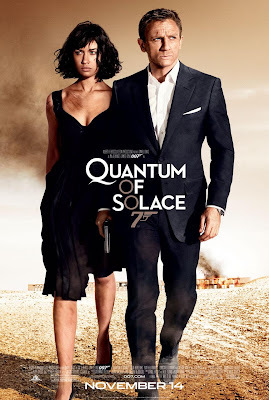 We talked about Quantum of Solace -- and you can hear what we had to say this weekend on fine TV stations everywhere. You know, I really like that poster: Pretty people looking roughed up and concerned. It hints at an interesting story to be told. P.S. Am very much looking forward to hearing your take on it on At the Movies! HOUSTON KTRK ABC Saturday 2:35 a.m. ... is that like tonight mate? Actually, it'll air in Houston (according to the KTRK website) at 1:05 am tonight (well, actually, Saturday, but mever mind) and 1:30 pm Saturday.